Network address translation (NAT) is a networking feature that helps you connect environments that have overlapping IP addresses. 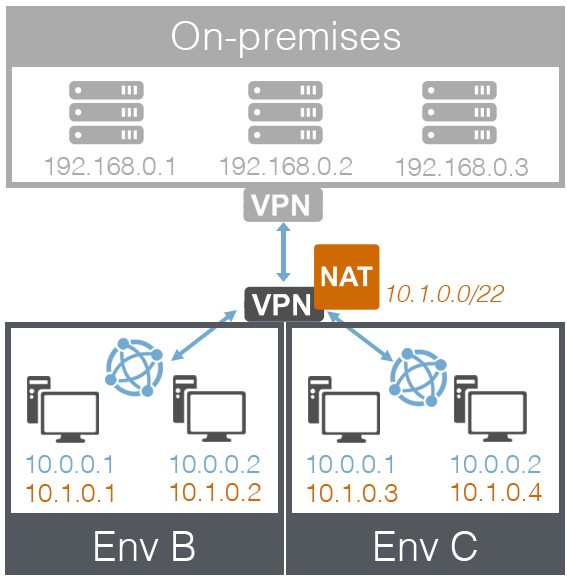 NAT prevents IP address conflicts by mapping a unique IP address to every VM on a connected network. This NAT IP address is used for inbound and outbound communication with the NAT-enabled network. By default, each Skytap environment has a private network that is isolated from other Skytap environment networks. This isolation lets you run multiple environments with the same network subnet at the same time. 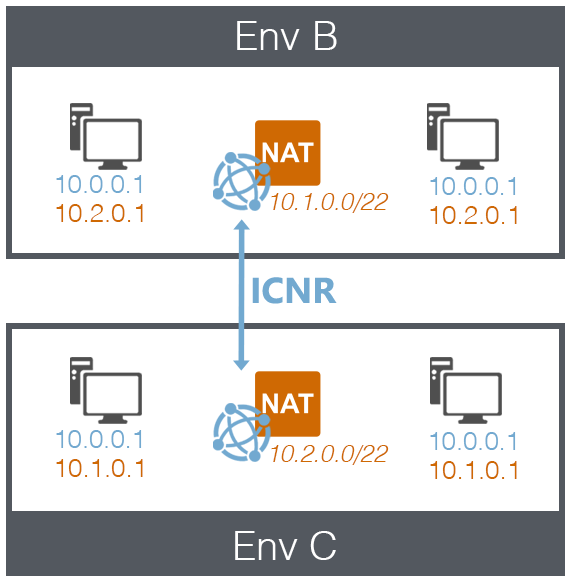 Occasionally, you may need to connect multiple environments together using ICNR (for example, to communicate across VMs or share resources between multiple environments). Rather than manually change the subnet of each environment to avoid IP address conflicts, you can enable NAT to automatically assign unique IP addresses to connected VMs. NAT can also be enabled on a Skytap VPN, allowing identical Skytap environments to connect back to your corporate network. 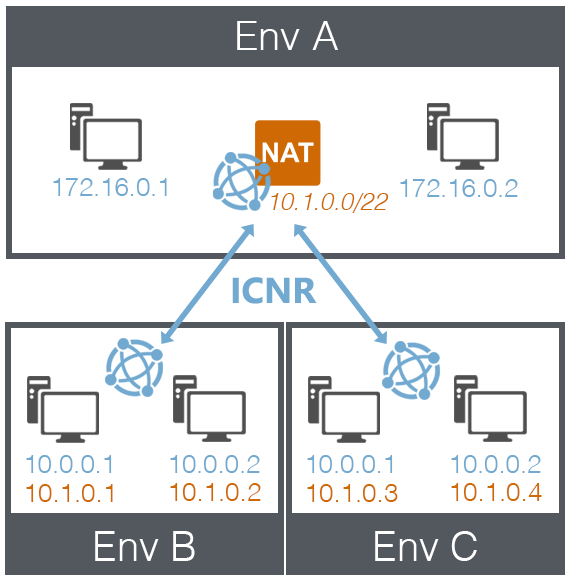 When NAT is enabled on a network, a NAT IP address is automatically assigned to each VM on a connected network. For example, if NAT is enabled on Network A and then Network A is connected to Network B, NAT IP addresses are assigned to the VMs connected to Network B. When Network A and B communicate, the VMs in Network B use the NAT IP addresses to send and receive traffic. Network A automatically assigns NAT IP addresses from the NAT subnet defined in its network settings. The Skytap subnet on the VPN is 10.1.0.0/22; this doubles as the NAT IP subnet. When NAT is enabled on a network or a Skytap VPN, a NAT IP address is automatically assigned to each VM on a connected network. The NAT IP addresses are allocated to VMs from the NAT subnet. The NAT subnet is defined the network settings (for NAT-enabled networks) or the VPN settings (for NAT-enabled VPNs). To avoid running out of NAT IP addresses, set the NAT subnet size so it is large enough to handle multiple NAT connections. We recommend a /22 subnet or larger. It is easier to set a large subnet during the initial network or VPN configuration than to extend the NAT subnet after NAT IP addresses have been assigned. The size of the network or the NAT subnet for the VPN. The IP addresses that are already distributed and assigned. The VM is disconnected from the network that is connected to the NAT-enabled network, or VPN. The VM network is disconnected from the NAT-enabled network or Skytap from the VPN. To enable NAT on an environment network, click Apply NAT for connecting networks in the network settings. For detailed instructions, see Editing an automatic network. To enable NAT on a Skytap VPN, select Apply NAT for connecting networks in the VPN settings. For detailed instructions, see Creating a VPN connection. To locate the IP addresses associated with a VM, including any NAT IP addresses, see Finding the IP addresses for a VM. Error: The operation failed because there are no IP addresses remaining in the NAT pool of one of the networks. Add VMs or network adapters to a network that is connected to the NAT-enabled Skytap VPN or to a NAT-enabled network. Connect any additional networks to the NAT-enabled VPN or NAT-enabled network. Disconnect a network from the NAT-enabled network. Disconnect VMs from the networks that are connected to a NAT-enabled network or to a VPN. Expand the subnet by disconnecting all networks, modifying the NAT subnet, and then reestablishing network connections. To edit the NAT subnet for a network, edit the network settings. To edit the NAT subnet for a Skytap VPN, edit the Skytap subnet setting in the Skytap VPN.